I’ve said it before and I’ll say it again: The more information you request at newsletter signup, the fewer people who will follow through and subscribe. Unfortunately, it turns out that I’m wrong. 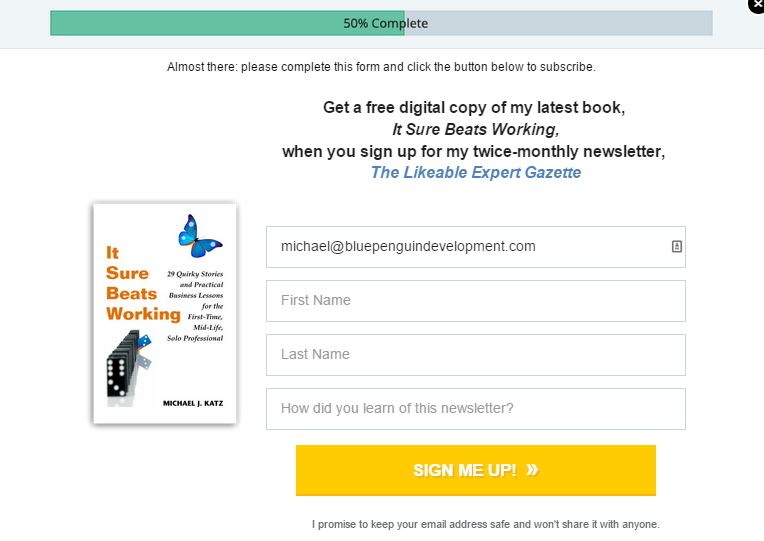 For the past 30 days, and using a service called Leadpages (affiliate link), I’ve been experimenting with two nearly identical versions of my newsletter sign up box. One (Original), asks only for email address (you can see it here). Frankly, I’m pleasantly surprised to see these results. I like asking for a name because it makes it easier to understand tracking reports at a glance (without a name, I need to try and decipher email addresses). And I like asking “How did you learn of this newsletter?”, because it gives me a sense of which people, web sites and miscellaneous sources are sending prospective subscribers my way (short answer: it’s a little bit of everything with the occasional big hit). Note, by the way, that regardless of which approach I use, only the email address is required; subscribers are free to not fill in the other boxes. I’m confident that if I required more information, there would definitely be a drop off in sign ups. Of course, I’ve been wrong before. I think this has more to do with the types of information you’re requesting. First and last name are minor identifiers. Ask for company name, title, address or (oh no) the phone number, and you will see a drop off (especially if they are required). A few thoughts on your “experiment”. First, how many variation 1 subscribers included all the requested information? The “conversion rate” is probably not much affected by merely asking for more information if it is clear that only the email is required and people ignore those other questions. Second, asking for name and “how did you learn” are minimally invasive compared to other bits of information that might be requested. If you asked for business annual sales, or size of customer base I expect that you’d have a lower conversion rate even with those answers being optional. You’d really kill the response if those were required. Third, the questions you asked were reasonable from a subscriber’s perspective. 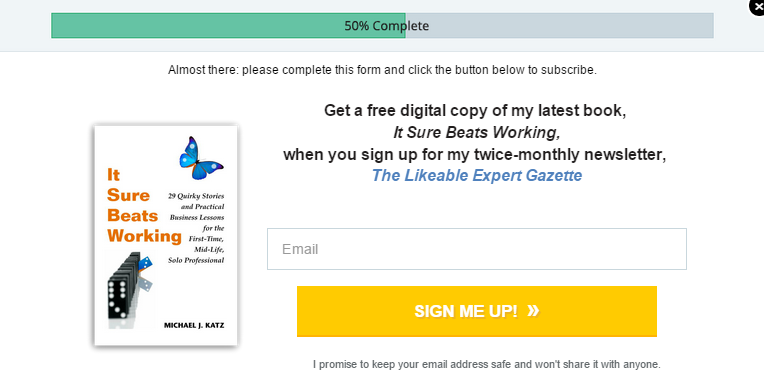 Having the name of a subscriber allows you to communicate more like a human with the subscriber (“Dear Michael” instead of “Dear baldguy@mail.com“) and a subscriber can understand that it’s a big help to your marketing to know where he or she learned about you. So I think the lesson is that it’s okay to ask for additional information if it is a) optional, b) relevant, and c) respectful (e.g., not invasive). BTW, at the other extreme I’ve been on sites where I wanted to download a product information PDF – something I should just be able to click on – and been required to provide email, name, and sometimes even set up a password. Geesh, don’t they want me to see their product information. Thanks Bob and Bruce. You may be right. Looks like a great tool, Rachel! And thanks for pointing out the fact that there’s more data needed.